Photo: Fr. Frank speaking at the prayer vigil. Bryan Kemper, Director Youth Outreach to his left. PHILADELPHIA, July 19, 2013 (LifeSiteNews.com) – A group of pro-life activists who were prevented from delivering a letter to the Philadelphia Medical Examiner’s office this morning demanding the release of the bodies of Kermit Gosnell’s victims for burial, say they are now prepared to engage in civil disobedience to ensure that the babies killed by Gosnell are treated with dignity. Despite warning the Medical Examiner ahead of time that they were planning on delivering the letter, when the pro-life activists approached the door, staff in the building locked the door, and called the police. Now Bryan Kemper of Stand True Ministries and Priests for Life tells LifeSiteNews.com that he and several other pro-life leaders are planning a rally and prayer vigil, called The Cry for Dignity, on Sunday, August 25, followed by peaceful civil disobedience the following morning. According to Kemper, at least 25 activists will kneel down in front of the doors of the Medical Examiner’s building on the Monday morning, each holding a sign with the name of one of Gosnell’s victims. “We will not leave, until they release them, or arrest us,” he said. When investigators raided Gosnell’s “House of Horrors” clinic in 2010, they were shocked to find the mangled bodies of babies frozen and stored in a variety of containers, including milk jugs, cat food cans, and even a cherry lime-ade container. Gosnell kept the bodies of his victims in the clinic after falling behind in his payments to the medical waste company that normally collected them for disposal at a landfill. In addition to Priests for Life, the Philadelphia Catholic diocese has also put in a request to obtain the remains of the babies. However, so far the Medical Examiner has refused, saying that at some undetermined date the bodies will be cremated and buried. But pro-life activists say that's not good enough. 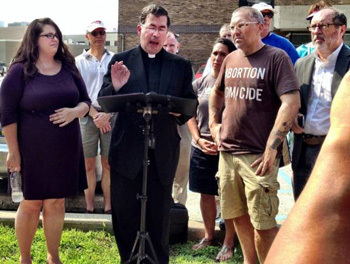 About 50 pro-life activists participated in a prayer vigil outside the Medical Examiner’s Office on Friday morning. Afterwards, five of them attempted to hand-deliver the letter. Kemper said the decision to lock the door took them by surprise, since previously staff had given the go-ahead for them to deliver the letter. The Medical Examiner also called the police, who asked to meet with the pro-life group's attorney. However, the Medical Examiner staff rebuffed even that level of dialogue, said Kemper. "The attorney tried to go in, but they told her flat-out no, they will not talk to us, they already have a plan in place." “Gosnell was convicted of murdering human beings, not medical waste,” Kemper said. “These human beings, just like any human being, deserve the dignity of a proper funeral and burial." The letter, penned by an attorney with Alliance Defending Freedom, said, "[T]he public must be told where the bodies currently are. This is particularly relevant where the unclaimed victims are related to such a public, notorious criminal prosecution, followed closely by the media in all respects." "Proper burial is the right thing to do, for the human dignity of the babies themselves, for the healing of post-abortive women," the letter said, "and for the future and conscience of Philadelphia and the nation…This is what a civilized society does with its dead." "We have made our request very public over the last few months; now we want public answers," said Fr. Pavone this week. Also present at this morning’s rally were Kristan Hawkins of Students for Life, Fr. Frank Pavone of Priests for Life, Rev. Pat Mahoney of the Christian Defense Coalition, and others.